This impressive resort boasts an idyllic setting amidst almost 20 acres of tropical gardens and situated directly in the enchanting white sandy beach. 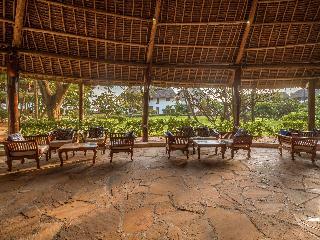 Set just outside the town of Nungwi, this stunning hotel is a perfect place for peaceful and relaxing holidays. The establishment showcases a charming design, combining elegance with Zanzibar elements. The large and bright rooms and suites offer unmatched luxury and peaceful atmosphere in which to completely loosen up at the end of the day. Travellers may enjoy mouth-watering continental, international and Zanzibari cuisines served at the charming hotel restaurants. The on-site spa offers a wide array of relaxing treatments and guests may take a cooling dip in the 4 free-form pools or unwind in the sauna. Those more active may make use of the fitness centre or play beach volley and those who seek peaceful downtime may enjoy hotel entertainment. 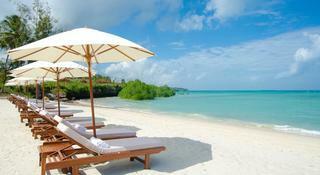 This resort hotel is located on the west coast of the exotic island of Zanzibar. 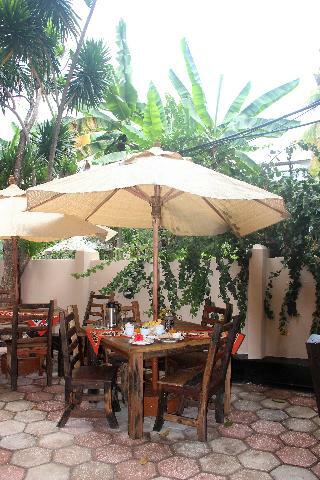 It is conveniently set 20 km from the historic town of Stone Town, where restaurants, shops, bars and nightclubs can be found. The hotel is only around 200 m from the beach and sea. Zanzibar is a unique destination filled with history and character, beautiful beaches and wonderful people.This beautiful beach hotel offers a unique combination of modern facilities and the original exotic architectural style of historical Zanzibar. The air-conditioned hotel was built in 2010 and offers a total of 120 accommodation units. Guests are welcomed in the lobby, which offers a 24-hour reception and a 24-hour check-out service, as well as a hotel safe, currency exchange facilities and a cloakroom. The hotel also features a children's playground, as well as a restaurant, bar and pub. Other facilities include wireless Internet access, and room and laundry services are available to guests.All rooms offer an en suite shower, as well as a direct dial telephone, satellite/cable TV and Internet access. The rooms also come equipped with a hairdryer, radio, hifi, safe and minibar as standard. Additional features include a fridge, tea and coffee making facilities and air conditioning. Each room also features a balcony or terrace. 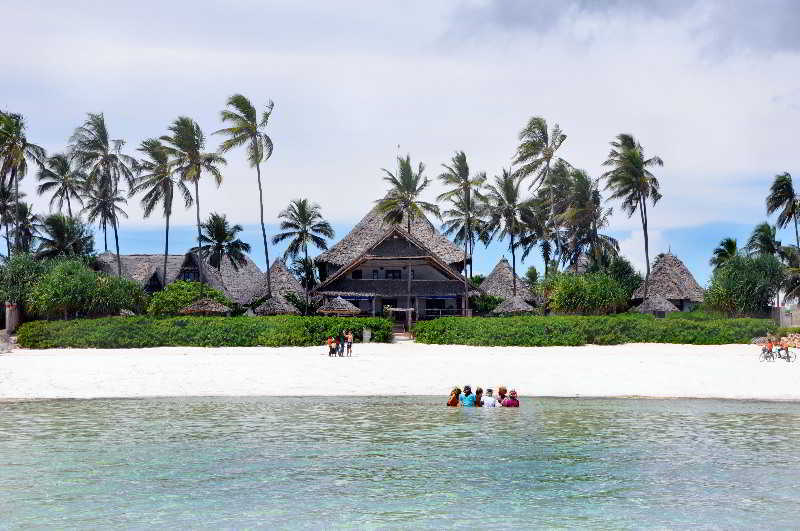 This resort is located on the northern tip of Zanzibar, on Nungwi beach. The resort's private beach is available for all guests to enjoy. It lies only an hour's drive from the airport. The exotic resort features modern amenities suited for both business and leisure travellers. Facilities on offer to guests at this air-conditioned establishment include a lobby area with a 24-hour reception and check-out service, a hotel safe, a currency exchange facility and a hairdressing salon. There is a games room, hairdressing salon and a children's playground. Refreshments are available at the cafe, 2 bars and breakfast room. Guests also have conference facilities and WLAN Internet access at their disposal. Complimentary parking is also available. All air-conditioned rooms feature a private balcony, a bathroom and a king-size bed. They are equipped with an LCD TV, Internet access and a minibar. 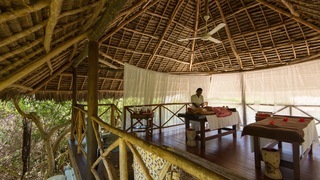 This up-scale and luxurious hotel is the best accommodation option when travelling to Zanzibar on business or leisure. The property is surrounded by 12 hectares of a tropical garden with more than 1,000 palm trees and is located right on a white sandy beach. Thus, this property offers high-quality facilities and sits on a place of pure beauty that resembles paradise. There is a wide accommodation offer to suit all guests' needs, all of them fully equipped and nicely decorated in a cosy style to ensure visitors have an unforgettable stay. Upgrade includes superior and elegant furniture, extra space for added convenience and an external veranda or balcony. Guests will appreciate the exquisite and varied dining facilities on-site, as well as other fun-filled or relaxing activities included, such as a spa and wellness centre and a recreational and water sports centre. Hotel was constructed in 2014. There are a total of 18 rooms on the premises. The property consists of 9 double rooms and 9 bungalows. This hotel is the perfect base for exploring the area. Located in the city centre, the Hotel allows easy access to the city and all it has to offer. The nearest bus and metro stops are within walking distance from the Hotel . The Hotel is a quick drive from the airport. The main entertainment areas of the city are within easy reach of the Hotel . Guests can find the nearest golf course only a short drive from the property. Guests will find the beach at just a few minutes from the property. The Hotel is located a few steps from the harbour. The Hotel Riu Palace Zanzibar is located on Nungwi Beach, a beautiful white-sand beach with crystalline waters that will make you feel like you're truly in paradise. This resort in Zanzibar, Tanzania, offers free WiFi and the exclusive amenities of RIU Hotels & Resorts to make your holiday an unforgettable experience.The rooms at this hotel in Zanzibar are notable for their design and spaciousness. In all of them, you'll have free WiFi, air conditioning, satellite TV, a minibar, and a balcony or terrace. Plus, the hotel has villas with private pools for those who want a stay in total luxury.At the Hotel Riu Palace Zanzibar you can enjoy a refreshing dip in the pool with sea views, relax under the sun in a lounge chair, or go to the beach thanks to the direct access from the hotel. When it comes to gastronomy, you have the main restaurant for enjoying buffet breakfasts with show-cooking stations, and two theme restaurants that serve exquisite dishes. Fun and relaxation are guaranteed during your holiday in this paradise. Thanks to our entertainment programmes, you can enjoy activities and live shows and music. At at the spa of the Hotel Riu Palace Zanzibar, we offer the best services and treatments so that you can go home from your holiday totally renewed. Likewise, the most athletic guests have the gym to practise their favourite activities and also the option of enjoying aquatic sports like windsurfing and snorkelling.Zanzibar, once known as Spice Island, is the perfect place to enjoy a holiday in paradise. We recommend that you sign up for an excursion to see the most emblematic places in the area or to have an authentic African experience. 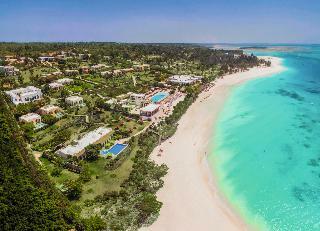 Discover Zanzibar with RIU Hotels & Resorts! 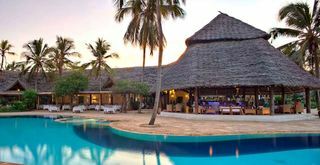 The hotel is located in Matemwe and boasts its own private sandy beach, the city of stone is 45 km all the rooms feature stylish décor with wooden beams views and ethnic motifs. Some suites have a sitting area with t.v. all morning a buffet breakfast is served, which also has a restaurant that offers a menu of traditional cuisine, delicious and varied from Zanzibar, European specialties and fresh seafood dishes. The bar is ideal to enjoy a cocktail and a selection of drinks. 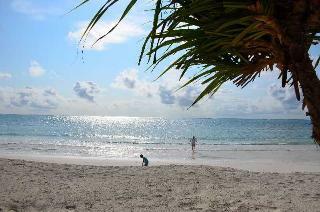 The hotel is 53 km from Zanzibar airport and 46 km from the city of stone Ferry Pier. This resort sits on a private beach, in Makunduchi. The resort is set close to many prominent points of interest in the area. Guests will find themselves just a short distance away from the stunning beaches of Jambiani, Kizimkazi and Paje. Guests can enjoy a range of exciting activities nearby, including swimming and snorkelling.Since august 2016 there is also the diving school DiveTime Zanzibar (www.divetimezanzibar.com) located in the hotel. They offer diving courses for beginners and also for experienced divers as well as snorkelling trips. Guests will find themselves in the ideal, luxurious setting, from which to explore and experience the culture and traditions of Zanzibar. This wonderful resort comprises elegantly-styled guest rooms, which offer an unrivalled, tropical-living experience. The hotel offers an array of first-class facilities and services, meeting the needs of every type of traveller, to a high level of excellence. Zanzibar is an archipelago found in the Indian Ocean 25 kilometres off the coast of Africa and very close to the equator. The island of Zanzibar is known by locals as "Unguja" and is famous for its beautiful beaches with crystal-clear water, as well as for its coral reefs. The port of Stone Town attracts the most visitors to Zanzibar's coast, and has been designated by UNESCO as a World Heritage Site. The archipelago is popular with tourists all year round due to its tropical climate. 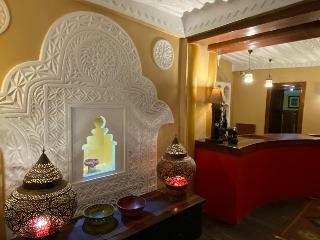 Hotelopia offers the best and most exclusive hotels in Zanzibar.